Crisp golden brown pancakes served with applesauce. Fried mozzarella accompanied by marinara sauce and parmesan cheese. Herring in a wine sauce with onions, sour cream, sliced tomato and pickled beets. Chicken wings served with house bleu cheese dressing and celery sticks. Mushrooms with crabmeat stuffing, finished with a white wine butter sauce. Three styles of wurst: German sausage, bratwurst and knockwurst. Served with German sauerkraut and a zen mustard. Choice of German sausage, knockwurst or bratwurst served over sauerkraut. Deep fried corn fritters drizzled with maple syrup and finished with powdered sugar. Imported from Germany, A great starter plate to share. Crisp golden brown pancakes, served with applesauce and sour cream. Chopped meat and vegetable salad topped with marinated celery. Tender apples, raisins and walnuts wrapped in a light flakey pastry served with whipped cream and a dash of cinnamon and powdered sugar. BBQ- Pulled Pork Stuffed Potato Pancakes with House BBQ Sauce. Reuben- Corned Beef and Sauerkraut Stuffed Potato Pancakes with Thousand Island Dressing. Choice of Bratwurst, Knockwurst, or German Sausage on a Gourmet Roll with Sauerkraut, Beer Mustard and a side of Cole Slaw. Potato Pancake "Fries", Seasoned Ground Beef topped with a Peppercorn Gravy. Fresh Pork and Beef Meatballs over Spatzle topped with Brown Gravy. Pretzel Bites served with Beer Mustard. Mixed Greens with Craisins, Walnuts, Crumbled Bleu Cheese with a Raspberry Balsamic Vinaigrette Dressing. Corned Beef Brisket smothered with our house Sauerkraut, Swiss Cheese, and Thousand Island Dressing. Served with French Fries. Your choice of our own breaded Schnitzel served over a bed of Spatzle. Our own breaded chicken cutlet with a paprika gravy. Fresh roast turkey served with herb stuffing, cranberry sauce and brown gravy. Our own breaded cutlet with a hearty meat sauce and provolone cheese. Served with linguine or choice of potato. Tender New Zealand shank served with brown gravy and mint jelly. Our own breaded chicken cutlet with a hearty meat sauce and provolone cheese. Served with linguine or choice of potato. Tender pork medallions served with sautéed mushrooms and a burgundy gravy. Tender pork medallions with a hearty meat sauce and provolone cheese. Served with linguine or choice of potato. potatoes, potato pancakes or french fries. Choice of two knockwurst or bratwurst, served over sauerkraut. Our own traditional Hungarian goulash. Sliced marinated beef with a rich sour cream gravy, served with red cabbage and choice of potato. Our own breaded cutlet with a rich sour cream gravy. Our own breaded cutlet with a paprika gravy. Our own breaded cutlet with sautéed mushrooms and a rich brown gravy. Our own breaded cutlet with a sunny side egg and a wedge of lemon. Two tender thick slices of roast pork topped with a demi glacé, served with sauerkraut and applesauce. Tender slices of beef brisket with a rich brown gravy, served with red cabbage. Served with your choice of mashed potatoes or french fries. Your choice of our imperial crabmeat stuffing or our cracker crumb, served with lemon and drawn butter. Tender sea scallops, lightly breaded and broiled to perfection. Delicate fillets of sole stuffed with our crabmeat stuffing, topped with bread crumbs and white wine. Lightly breaded and broiled to perfection. Potato Pancakes, Mashed Potatoes, French Fries, or a Side Salad. Corned Beef Brisket smothered with our House Sauerkraut, Swiss Cheese, and Thousand Island Dressing. German Pot Roast topped with our House Cole Slaw, Smoked Cheddar Cheese, and House BBQ Sauce. Shaved Prime Rib, Provolone Cheese, Sautéed Onions, and Horseradish Mayo. Jenga Cut and served with Onion Dipping Broth. Choice of Bratwurst, Knockwurst, or German Sausage on a Gourmet Roll with Sauerkraut, Bier Mustard and a side of Cole Slaw. Mixed Field Greens Topped With Sliced Wurst And Marinated Celery. Mixed Greens tossed with Walnuts, Bleu Cheese Crumbles, Craisins, Tomato, and a Raspberry Vinaigrette. Mixed Field Greens Topped With Cucumbers, Tomatoes, Shredded Carrots And Olives. 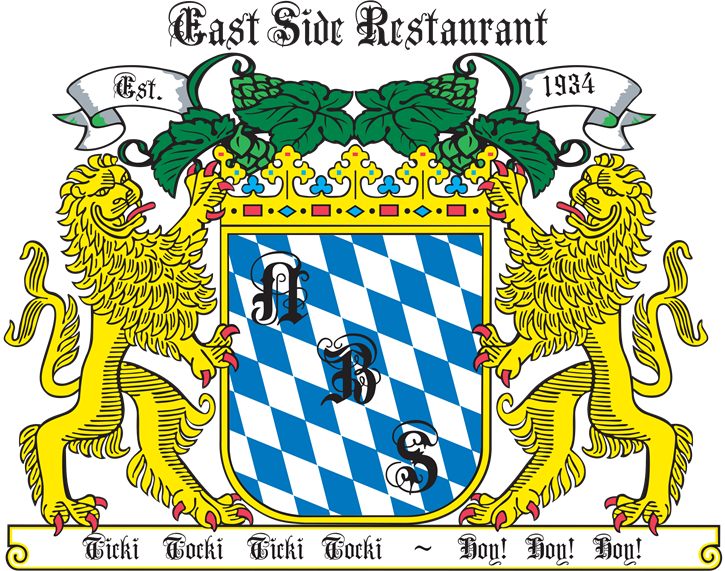 Everything is an East Side Specialty. Crisp jumbo shrimp complemented by our own cocktail sauce. Mushrooms with a crabmeat stuffing, finished with a white wine butter sauce. Clams served chilled on the half shell with lemon and cocktail sauce. Imported from Germany. A great starter plate to share. Served with your choice of mashed potatoes, french fries or au gratin potatoes (weekends only). Tender slice of beef stuffed with caramelized onions, bacon, pickle and mustard topped with a demi glace. 16 oz. cut of slow roasted prime rib served with au jus, when available. 12 oz. sirloin steak served with sautéed mushrooms. Our own breaded cutlet with a hearty meat sauce and provolone cheese served with linguine or choice of potato. Our own breaded chicken cutlet with a hearty meat sauce and provolone cheese served with linguine or choice of potato. Tender New Zealand shanks served with brown gravy and mint jelly. Tender braised short ribs cooked to perfection smothered in our rich brown gravy. Our own breaded cutlet with a hearty meat sauce served with linguine or choice of potato. Half roast duck served with herb stuffing, cranberry sauce and brown gravy. au gratin potatoes (weekends only). Choice of two: bratwurst, knockwurst, or German sausage. Served over sauerkraut. A grilled hickory smoked pork chop with a demi glacé, served with sauerkraut and apple sauce. Your choice of our imperial crabmeat or our cracker crumb stuffing, served with lemon and drawn butter. Crisp sautéed shrimp in a garlic, butter, wine and caper sauce, served over linguine with a dollop of marinara sauce and a lemon. Oven roasted fresh salmon herb seasoned with your choice of potato. Sample four of our finest German drafts! Classic Munich lager, blonde color, well balanced taste. An amber Munich traditional fest bier. A big, bold, full bodied, dark bier. Smooth and slightly sweet. No bitterness. Don't let the color fool you. A dark, malty, sweet, true German doppel bock. A light tasting, pale colored, very hopped up brew. The largest selling bier in Germany. Classic pilsner. Great bier for the person who enjoys lighter biers. 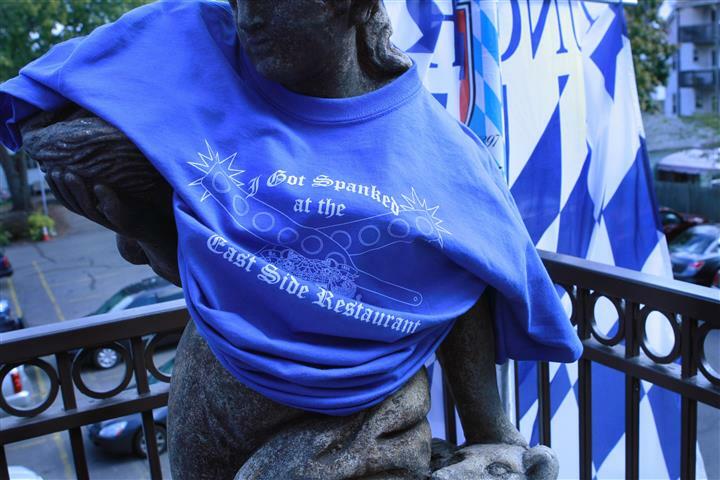 The original brew of Bavarian Kings. Full bodied and well balanced. An unfiltered wheat bier. Cloudy, golden color, light spicy taste. 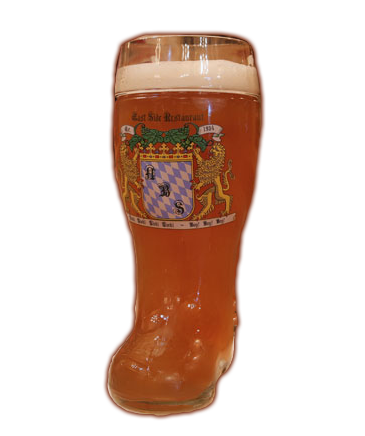 Take home your own novelty Das Boot shot glass. Shots marked with a * were created from the finest, fresh ingredients right here in New Britain. We are proud to present to you PEEL Liqueurs!And don't forget, they are naturally gluten free! ...and receive your very own "Just Got Spanked" t-shirt! Vodka and rich blood oranges, mingling with mangoes and passion fruit. Cool blue fusion of super premium vodka with tropical and wild berry fruit flavors. Apple and Cinnamon flavored schnapps are blended to recreate Oma's apple strudel. Multi-Award winning Bananacello is featured here. The real banana flavor will quickly make Banana Nana a favorite. Limoncello is found in this delicious 5° SHOT! This old Italian recipe is brought to life with fresh lemon taste. Creamonell is an exquisite blend of limoncello and cream to create this 5° beauty. Birthdays, Anniversaries, Club Meetings and Special Events. The Price Per Person is $26! 6.35% Tax and 18% Service Charge are Not Included in the Price. Beverages Will Be Sold on a Tab Basis. If Cake Is Brought In For Any Occasion, We Will Cut and Serve It With Ice Cream as Your Included Dessert. $14.95 + 6.35% Tax + 18% Service Charge Per Person Tuesday through Thursday. 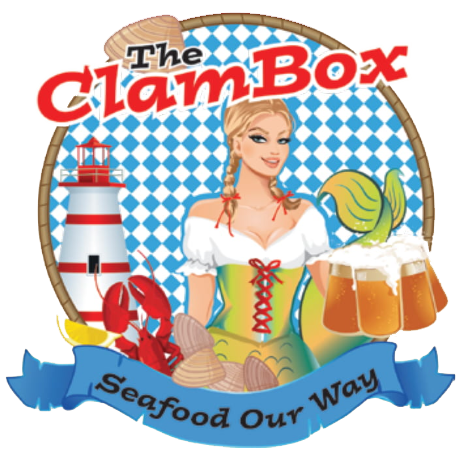 $20.00 + 6.35% Tax + 18% Service Charge Per Person on Weekends. $3.95 + 6.35% Tax + 18% Service Charge Per Person.